The “Hope” solution consists of an integrated, smart platform that enables the elderly people with Alzheimer’s disease to use innovative technology for a more independent life, easy access to information, monitor their health, which provides a basis for integrating services for the elderly population while they are at home. 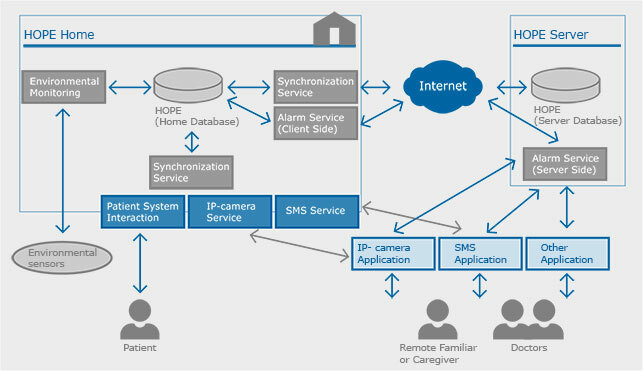 HOPE is a self-operated, self-adjusted, innovative intelligent IP Based Universal Control Box (UCB) that uses intelligence to manage the various connected subsystems and devices within a residence of the elderly people. HOPE is a budgeted solution that is installed at the elderly people’ homes, and provides services for (a) life-long, self-organized, appropriate educational environment and access to information, (b) care management and health support, (c) self-monitoring and decision making. The HOPE solution consists of an integrated, smart platform that manages a smart home with different functionalities for security, fall detection and communication. HOPE system can be modelled as a distributed system where many agents (subsystem located in each patient 's home) are connected to a main agent, the HOPE server, using IP communication due to Internet access is currently insured everywhere in Europe. So that, HOPE can be split up into two main blocks: the Server Block and the Home Block which represent the main agent and every subsystem at each patient’s home respectively. On one hand, HOPE at Home Block covers functionalities associated to each patient’s environment monitoring, indicating alarms if necessary, and is a friendly and accessible interface between patient and services or applications provided by the system. The Home Block covers functionalities associated to each person’s environment monitoring, indicating alarms where necessary, as a friendly and accessible interface between older person and services or applications provided by the system. Main objectives or functions can be modelled like different blocks or components that can be observed in Figure 1. Data acquisition from environmental (temperature, motion, state of the door, gas leak) and health (falls, heart pulse) sensors. Alarm notification to the user, using voice messages, in case the environmental condition assessment identifies any dangerous scenario that might provoke a fall or other dangerous situation. Simple interfaces for monitoring to relatives, doctors or caregivers, using SMS mobile applications, video monitoring, or by other applications/means. Storage all information from any Home System. Alarm service in case of a fall detection to caregivers and relatives. Decision Making and provision of rules for estimating the most appropriated scenario. Interfaces to relatives and doctor to access to the different services. Patients that are in the initial stages of the disease: The proposed project will support the elderly people to continue with their daily tasks without, for example, afraid to leave an appliance ON or the door open. With HOPE, they continue feeling useful and capable to participate in life. Also, they have more energy, have a better social life, continue to be independent, and therefore the disease will become slower in affecting them. Doctors who try to retrieve this information from relatives and people that are close to the patients. This is not always an easy task since, for example, the relatives may be at work, and the maids are usually interchanged among many, and all are not in the position to understand and explain the exact behavior of the patient. HOPE is able to provide them with accurate and detailed information regarding the daily behavior of the elderly people, and therefore become a useful tool in the hands of the doctors for the selection of the best medicine and treatment procedure. The relatives and maids of the elderly people. It is widely accepted that the real victims of Alzheimer disease are the people that care the patients with the disease. They are faced with a problem above their knowledge and power. Many times their personal, family and professional life is destroyed and the whole process may result in greater possibility for diseases such as cancer and / or others that are related to the chronic stress that they suffer. HOPE project helps these people to continue their life without ruin their financial and personal status, be much calmer and have a better relationship with their patient.